One of Cambodia's most unique event venues, it's hard to top Belmond La Residence d’Angkor. Enveloped by thick jungle and moments from Siem Reap, it’s a dream spot for any occasion. Whether a work conference, intimate party or lavish jungle wedding, our team can make your ideas a fully fledged reality. Our verdant gardens and veranda create an enchanting backdrop for alfresco parties and gatherings of up to 30 guests. 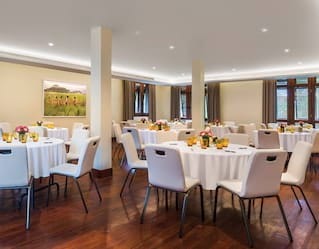 Or host up to 90 guests in our spacious 92m2 events room, flooded with natural light and boasting top-tier technology. Our dedicated team is on hand to take care of all the details. Cambodia is fast becoming a popular Asian golfing destination. Treat clients or reward employees at one of the premier courses close by. Phokeethra Country Club offers outstanding facilities, just a 40-minute drive away. Or why not try the Angkor Golf Resort? 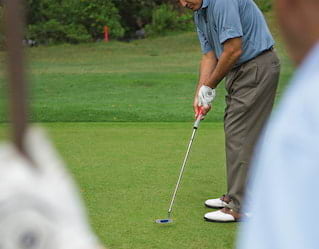 Designed by Nick Faldo, this 18-hole course is just a 20-minute drive from the hotel. Siem Reap Lake Resort is a 30-minute trip and perfect for beginners.